Well, it's just about that time. The Smalls had surgery yesterday, everything went fine, which means they'll be leaving very, very soon. I'm not sure I am. Bye bye babies...it was so nice knowing you. They were so lovely! I'm sure they'll find wonderful homes! Oh angel faces! You will be missed. Oh. My. Goodness. Cutest group pic ever! How I will miss the Smalls...but I am excited to hear all about their new parents and homes-They do look ready for their gold medals, don't they? I just know that someone has secretly arranged for them to come live with me. Of course I also know that I have won the lottery even though I rarely buy tickets. Well, at least whomever adopts the Smalls will be the luckiest person(s) in the world. I'm sort of excited to see if all four go to one home. I know that's kinda crazy (in a kitten-overload sense), but this bunch have convinced me that the next time I am ready to adopt, I'm just gonna go all-in and bring home an entire family. That's how much the loveable Smalls have influenced me. also, could they be making any cuter sad-faces in that pic?? I have a whole family...4 girls that are now 3. I couldn't split them up :) and they are all very different.. I decided that a long time ago after reading this blog for a while. I admire Laurie for her being able to let them go when it is time. I will stick with being the recipient of rescues... Homes are needed too!! They've been a Very Special Litter. You, Bean, and Ruth can be very proud. Noooo....I still haven't moved to Washington state so I can adopt Shrimp Louie! noooo!!! this is one of my fav litters in a long while!! i want all four of them! Do they have homes chosen for them yet? 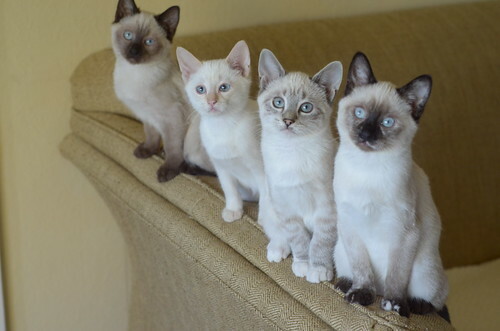 These little cats sure enjoy posing for the camera. Such happy healthy adorableness. Each one so unique! Really loved following their progress. Envy the forever families that get to cuddle these sweeties. Goodness gracious...the Smalls are itty bitty bit-less now. Oh my... so cute little faces!!!!!! Aren't they just the cutest??? The only thing that would make the photo even cuter would be Miss Charlene laying across the back of the sofa. I know she's not a siamese, but her coloring would just fit perfectly! Have fun with your new adventures little Smalls! I think Charlene IS a Siamese mix, although only Laurie could say for sure. Will their eyes stay blue, do you suppose? I think they will at this stage. Normally they change from blue to whatever by 6 weeks. They definitely have siamese in them making it all the more likely. Oh those dearest little sweet babies. SIGH! Aww, we're not ready! But it's always wonderful when a kitty gets a forever home, so... ok, we'll allow it..
Is it possible, before they go, to get a close up of those adorable white toes on the first kitten in line's foot? I'm sorry I don't know which one that is... But those toes kill me! Those eyes! And seriously, Liam, stop being such a cutie pants--you've almost got me thinking you might be cuter than my Oskar...and that just can't be true! Oh those blessed blue eyes and sweet faces. . . Their newfound peoples better sign a committment to give us LOTS of updates! Bye, Louie! I'll miss you, shrimp! Oh those blue eyes. Darling Liam looks as soulful as my boy and could almost be my boy's twin! these babies have blossomed under your care as all their predecessors have. thank you for pouring love and time into these little sweethearts! Are there any shots of Charlene with the Smalls, either individually or as a group? I posted a couple when they first were released from quarantine, but haven't posted others since.